Jose's Art Journal: On Perfection. 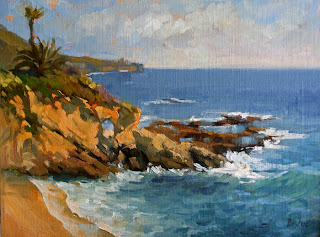 Last Saturday Laurie Hendricks and I went for a critique and painting session organized by the Laguna Plein Air Painters Association . The host was Michael Situ. We managed to arrive quite late but I think the light was incredible regardless. I did the above 9"x12" study of some cliffs. Lately, it seems my painting has stagnated a bit. I used to get very worried when I noticed this stagnant periods. Now I feel this months of insatisfaction are more like pregnant pauses, sometimes even long pauses. I know I am comparing myself to other artists or using the same old tricks again and again or, worse, I am not connected with the joy of painting because I set to do other things, like paint for a specific show or try to finish in two hours. We have a saying in Spain: "The Perfect is the enemy of the Good". This doesn't mean one shouldn't strive for perfection but that one must know that it is the striving that constitutes the goal, not perfection itself. How many good paintings have I crushed in frantic overworking. How many times have I changed course mid-painting because I saw someone hit the nail in the head or deplored mistakes that became such a big deal (when they needn't be). The joy of painting is sucked out of it when this perfectionism finally backfires, when one tries to be in many places at a time mentally and physically. Even very tight and careful painters experience this. May be even more than loosey-goosey artists. I will try to apply a remedy that has worked before for me: breathe. Yep. Remember to breathe. If I had a camera I'd see myself frowning and grabbing that brush like one grabs a handle in a roller-coaster when I am in the negative zone of "it has to work". I'll take five minutes or twenty before I dive in. Contemplate. Make a tonal study. No rush, no goal besides getting an idea down on paint, whatever idea you like, wherever down is, on paint. Let the painting breathe as well poor thing. Let it paint itself . Aren't those the best? And here, just for kicks. 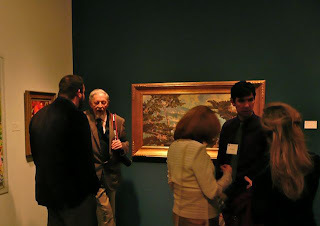 A picture of Richard Schmid talking to Tony Pro with Daniel Keys close by at the California Gold Medal show of the California Art Club. Ok, so perfection *is* possible in a few individuals. But just so that you never ever feel completely satisfied. Okay... So I'd like to come even CLOSE to YOUR "good". Everything is relative, Jose. And yes... lighten up and enjoy it... It will be fine. It is after all, the journey that matters, isn't it??? We'll really never get "there". Even Schmid is trying to learn new things. It comforted me to read this post, because I am in a painting confusion now. I've only been painting almost 3 years now, so I really don't have the right to complain, but it's discouraging to look back and not see anything you've done that you really like. This cliffs study is lovely, by the way! Oh yes,Marian I agree wholeheartedly. I am not upset or anything, just need to unclench a bit. Frankly, I think it's the "non paint related" things that get me in a state and pounce when I am trying to just paint. Hi Judy. Nothing that you like? Not even a little bit? If you allow me to suggest something: You've painted for three years so I think you would be very receptive to classes. I am not talking about workshops with some genius but things like drawing, anatomy, perspective, tonal and color theory...Classes narrow success to bite-size chunks, dispel confusion and many a painting's wonder hinges on getting just *one* of those things right.